A specific link, a small thread that is invisible to the human eye, mostly incomprehensible to the mortal brain. This small, thin yet strong fiber connects us to something supernatural, which I would call God. Mostly considered as childish, unrealistic and ignored, this is also the most debated topic in the intellectual circles. Now how does God come in the context of Consumerism and Psychology? Lemme explain. Facing tremendous pressure at work usually makes us question the reasons why things are not happening and how everything is like a sheet of ice which makes the ship that we are in, freeze, stuck. Hope for survival seems far off and destiny disappears in a mist of fog and we start smelling gloominess and death. Usually in such situations we start blaming things around us, people, team, colleagues and how things could have been better. I like looking at things around us and checking as to what is wrong and correct it but I also would like to bring in the element of God. God helps! If you have been following this blog for some time, you would observe that most of my posts tend to show my reverence to the supernatural power that makes me what I am and how I behave, achieve and grow in life. I have been fasting (or hibernating as I call it) for the last 14 days and asking for some answers from the Lord and nothing seems to move. I have seen this earlier... Locks falling off, doors that have been closed opening, stubborn solidified people melting and being super nice, approvals long pending passed, etc. This time it is taking much longer and I am growing weaker by the day. But when He opens up things, who is there to close? I will wait for things to open and trust me they would. This brings us to the point I want to make. Spirituality is a superlative dimension and associating it to work helps a lot. Doesn't matter if you believe in it or not. Helps you reach your targets, win over people, get hikes, promotions, perks, open doors, change people, change government rules, gets bills passed, deals closed and what not. Each one might take time to happen, but will happen. Trust is the key. I am not suggesting only God helps even if you don't work, but that this is an additional dimension to add to your hard work and passion. You must give 200% in whatever you do and then this would help. I always give my 200% and am asking for His help, specific things which need to happen and I am sure they will. I have seen things happen in the past, happening now and will see in future. Things that come out of no where, doors that you thought never existed open, help from the unexpected. When all else fails, try God. No let me refine that and tell you what I do. Try God and all else will fall in place. He will fill your cup to an extent that it overflows and you will know the force exists. Try and I am sure it will pay. 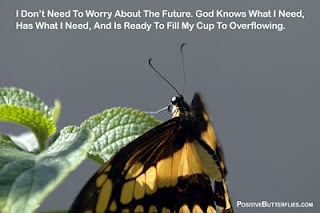 My cup shall overflow and I shall not want.